I Have Run: Easing my way back...into RUNNING! Easing my way back...into RUNNING! So I've been declared "healed" by my doctor. Two stress fractures in just over a year means I have to ease back into running slowly though. 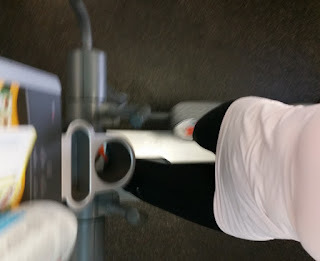 And by slowly, the doc said I have to "run" on the elliptical before I can actually run on a hard surface. But only for about a week. So if my elliptical runs feel good, I'll head out for my first real run in 70 days on Saturday. Instead of a run/walk interval program like I did last time, my doctor prescribed something different. Instead of one minute running followed by a longer stretch of walking and then repeating that sequence, I get to start with 10 straight minutes of running. That means I should get to run at least one solid mile! I am ridiculously excited about it. In the meantime, I have been ellipticizing, cycling and keeping up my strength training. I really like how strong I feel and the muscle tone I've gained over the past few months and don't want to lose it. I am also hoping it will help prevent future injuries! 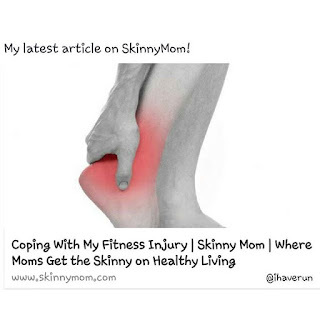 Speaking of injuries, my newest article to be featured on Skinny Mom is about how I have coped with this latest one. I JUST STARTED RUNNING AGAIN TOO! I've only been out for 2 months though (I got diagnosed with tendonitis in my foot after a cyclist hit me back in July). I went for just 5 minutes last night and it was very slow and felt very awkward, but there's no pain today which I am counting as a victory in my book. So happy for you, I definitely "feel your pain!" We'll be back in NO TIME! Good luck! Hope you have a speedy recovery! YAY! Good Luck! Hope you're back at it in no time! Two in one year! Ugh! Welcome back to running, sounds like you did good staying focused though. 10 minutes of running...I'm coming for you! Lots of pumpkin. Not so much running. Washing my hair can be exhausting. It's all a moo point.